Here are a couple of really cool photographs showing the construction of the Los Angeles Cable Railway along First Street in Boyle Heights sometime in 1889. 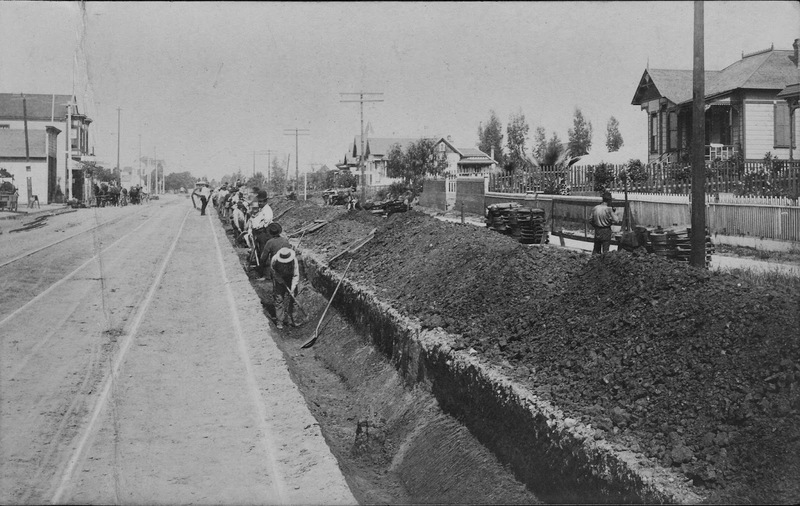 A cabinet card photograph from 1889 showing trenching for the construction of the Los Angeles Cable Railway at First near State streets in Boyle Heights, Stanton & Burdick. Courtesy of the Historical Society of Southern California. Click on any image to see them in expanded views in new windows. The first photo has an inscription indicating that the scene was on First and State streets (check out, roughly, what the area looks like today here) looking west. A crew of workers is busily employed digging a trench to prepare for the tracking. At the right are a couple of residences, while a some commercial buildings are down the street and to the left. The second view, a little further east on First near Cummings (click here for what the general location is like now) as noted on an inscription, was obviously taken some weeks later as the tracks are being installed up to the point where the group of people is congregated. Notice that there horse-drawn streetcar has been halted to demonstrate the contrast of the "old-fashioned" 1870s system to the new technology of the cable system. A mixture of residential and commercial buildings, including a grocery near the streetcar at the left, are partially in view. 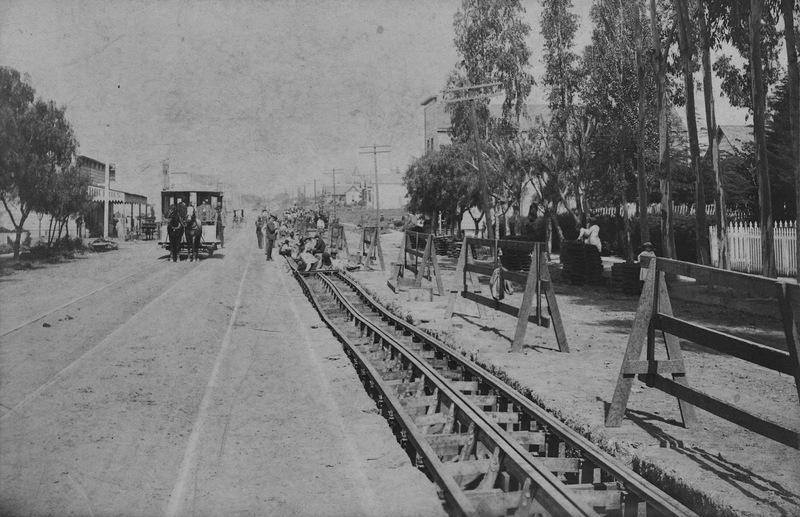 Another cabinet card view showing the laying of the Los Angeles Cable Railway's tracking system along First Street near Cummings, presumed by Stanton & Burdick. Courtesy of the Historical Society of Southern California. 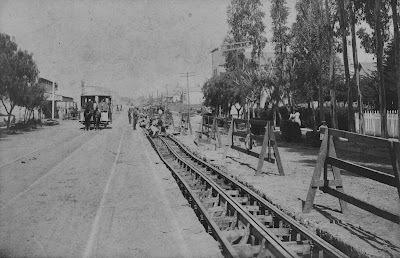 Both photos have, on the reverse, more notations stating that the line was "first cable line in L.A.." On the second view, a further set of notes read, "Broad gauge, double track horse car line, which W.H. Workman built to Boyle Hts & sold to cable company." It is worth noting that William H. Workman, who created Boyle Heights with partners John Lazzarevich and Isaias W. Hellman, had just completed a two-term as Los Angeles' mayor during the famed Boom of the 1880s. The inscriptions go back to at least 1933 because there are other inscriptions asking that borrowers "Return to Mrs W.H. Workman," this being Maria Boyle Workman, the daughter of Andrew Boyle, who bought Paredon Blanco, the property of Esteban López in 1858. After Boyle's death in 1871 and, as Los Angeles was undergoing its first sustained period of growth, Maria's husband, William, subdivided much of the Boyle property into Boyle Heights. Only the first image has a photographer's stamp, though it is likely both photos were taken by the same partnership of Stanton & Burdick. Thomas E. Stanton, born in Iowa in 1854, worked with veteran L.A. photographer Henry T. Payne through the first half of the 1880s before going out on his own. By 1888, he was joined by Chester W. Burdick, though their collaboration seems to have lasted just a couple of years--making their images pretty easy to date. The photographs are in the possession of the Historical Society of Southern California, which gave its permission for their use with this post. Speaking of photos, come down to the annual Boyle Heights History Day this Saturday the 7th from 10 a.m to 5 p.m. Among the presentations will be one at 10 showing old photos of the community, as well as other talks and performances. 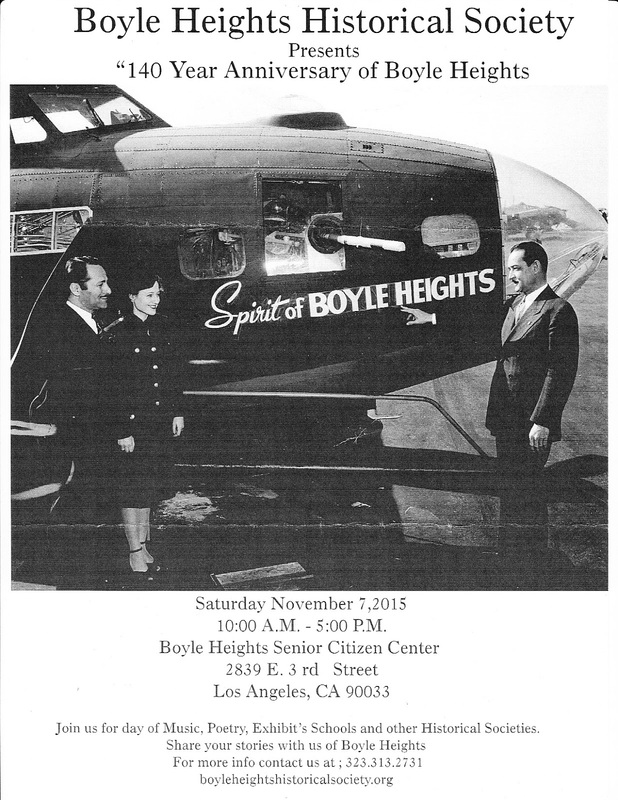 The location is the Boyle Heights Senior Center at 2839 E. 3rd Street, between Saratoga and Evergreen. For more information, call (323) 313-2731. "Street Railways and the Growth of Los Angeles" by Robert C. Post published by Golden West Books in 1989 has more pictures of the construction of the Cable Car line in 1889 as well as other historical information. The line operated on First Street for a few years before it went bankrupt and was replaced by a trolley car line that operated until 1963. There is a house in the background of the top photo (1876 E. 1st Street) standing just to the west of State Street on the North Side of 1st Street that is still standing and can be seen in the Google Picture although it is mostly obstructed by trees and the signs of the Auto Repair shop at the corner of State and 1st. A small restaurant now fronts the house. Hi Richard, thanks for the additional information on the L.A. Cable Railway. A longtime Boyle Heights resident also noticed the house you mention and was looking into whether it was the same one, which is why it wasn't mentioned, but thanks for confirming.